Wild House of Bees: "The Prototype"
This is NOT a house for HONEYBEES! Nope! The honeybees we're all so familiar with (Apis mellifera) originally come from Europe, and were introduced to North America in the early 1600s. 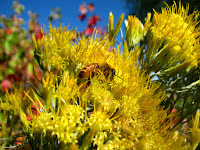 There are thousands of species of bees native to North America. Some are bumblebees (Bombus sp. ), which nest in social colonies in the ground. But the majority are "solitary bees"...mason bees, leafcutters, sweat bees, carpenter bees, masked bees and so many more. These wild bees don’t form hives, don’t make honey, and rarely, if ever, sting. Having no hive to defend, no honey stash to protect, makes for a very docile little bee. The females build nests in cavities (holes in the ground, in dead twigs, or hollow stems) and are important pollinators of native plants, fruit trees and early-season crops. 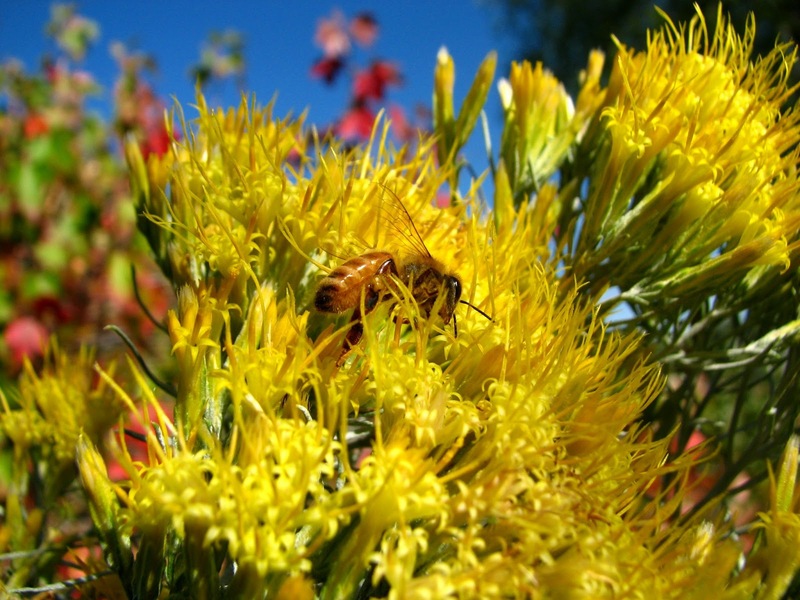 How does wild beekeeping work? Crawl in a tube, lay a little egg, stash a little bit of pollen, pack it with mud, repeat. As more and more wild places are replaced with houses and parking lots, native bees are having a harder time finding places to nest. 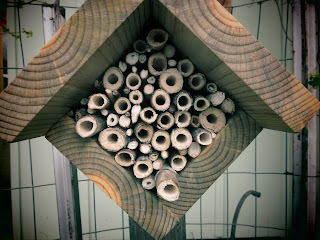 The Wild House of Bees provides a perfect bundle of nesting tubes that you can hang right in your backyard. 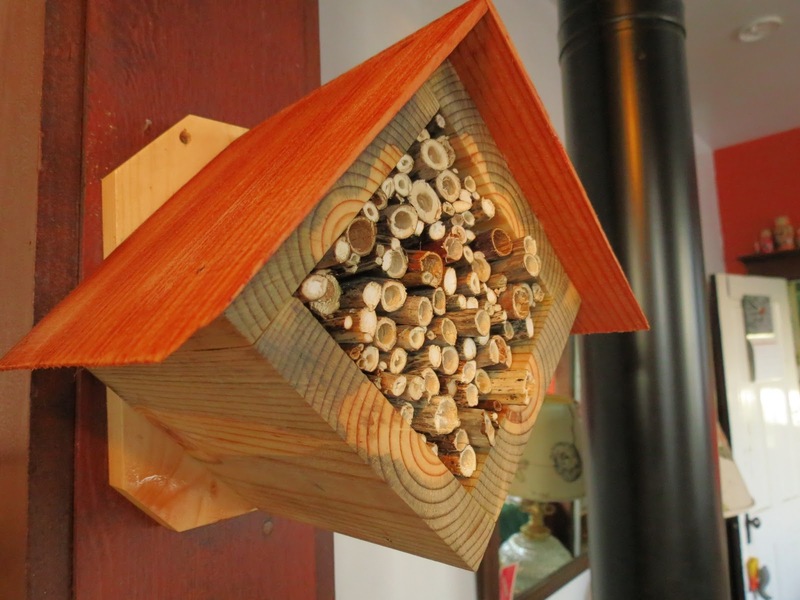 Every few years, you can remove the back mounting board of your bee house to clean out or replace the tubes. This will help discourage parasites and other bee pests. You can gather your own hollow-stemmed plants, or order a new bundle here. What else do bees need to stay HEALTHY? or have little tubes like a penstemon. *Water: A source of water is important in our dry climate. 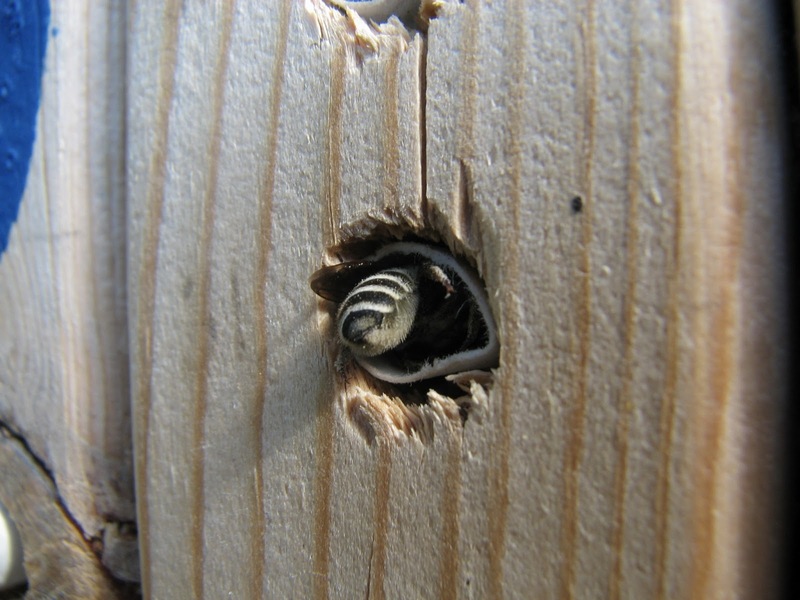 Also make sure there is some mud around; many bees will use it to build their nest cells. *Shelter: Try to keep your bee house out of heavy rain and winds. Hang it about 5 feet off the ground, facing south or east toward the warm sun. The tubes of your Wild House of Bees are 6" deep, and come from a variety of hollow- or pithy-stemmed locally gathered plants. I try to use invasive weeds like Fuller's teasel and Japanese knotweed when I can; it's pretty cool when I can tie weed eradication into pollinator conservation so nicely. 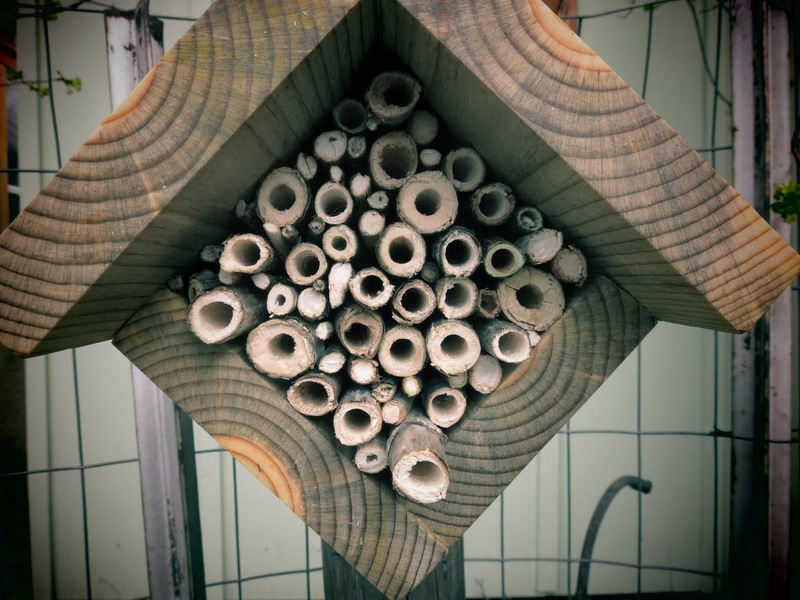 The holes range from 1/10 to 1/2" to encourage a variety of bee species to nest here, but most of them are exactly 3/8", the perfect size for mason bees (aka blue orchard bees, Osmia lignaria, the poster child for native bees). 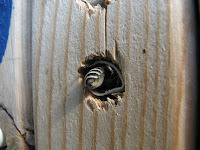 You'll see the mud-capped tubes of mason bees forming in early spring. Later in summer, other tubes will start to be capped with leaves. These are the leafcutter bees, Megachile sp. Who know what else will move in?! I'm always hoping a solitary wasp will come along and fill the tube with paralyzed spiders. Backyard ecology is so fun to watch. So...why be a wild beekeeper? *Observation! Watching wild bees nest year after year is endlessly fascinating, and a great way to learn about local plant and insect ecology. There's so much to learn about wild bees! Click here for a handy collection of what I've found to be the most compelling, entertaining and useful resources for wild beekeepers. 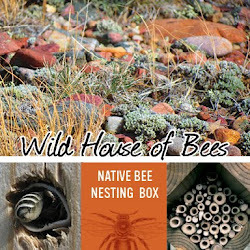 To learn more about Wild House of Bees, visit my Frequently Asked Questions page. Yeah for Bees! And hurray for sharing great info, thanks! Cool post, Leah! Very informative. Love the wild bee house!